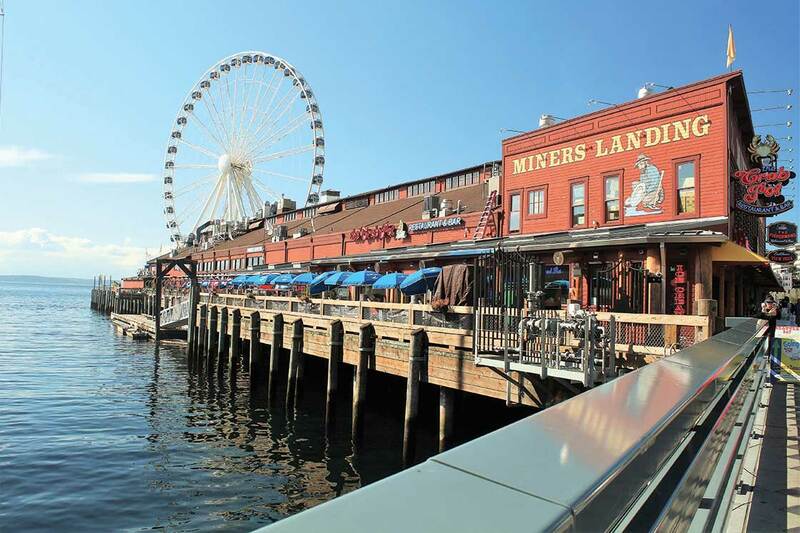 Head to this happening spot for the city’s best seafood, souvenirs, and sweeping views. A veritable bounty of just-caught seafood awaits at The Crab Pot, where the crowd-pleasing “sea feast” comes mounded with a heap of freshly steamed crab, clams, oysters, and more. Slurp your way through a menu of just-shucked oysters at Elliott’s Oyster House or happy hour favorites like spicy ahi tacos at Six Seven restaurant in the Edgewater Hotel. 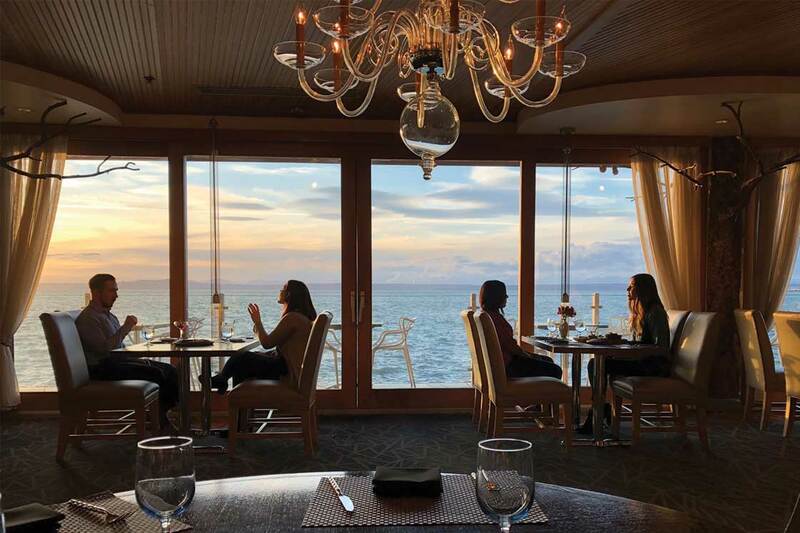 A refined experience awaits at AQUA by El Gaucho, where the parent restaurant’s signature steaks are complemented by sumptuous seafood and a gorgeous view at the edge of Pier 70. Canvas totes, wood pins, pine-scented soy wax candles, Sleepless in Seattle nighties, even “rain globes”—Simply Seattle is a standby when souvenir impulses strike. Ye Olde Curiosity Shop, which dates to 1899, is for odd ducks—literally. Among its trove of conversation pieces, you’ll find shrunken heads (replicas, thankfully!) and stuffed “four-legged”—you guessed it—ducks. Pick from 3,000 square feet of tees at Seattle Shirt Company, or score a hand-printed Seattle neighborhood poster from Pike St. Press. Chattering sea otters and harbor seals greet visitors at the Seattle Aquarium, which boasts an underwater dome with 360-degree views of Puget Sound’s aquatic residents. 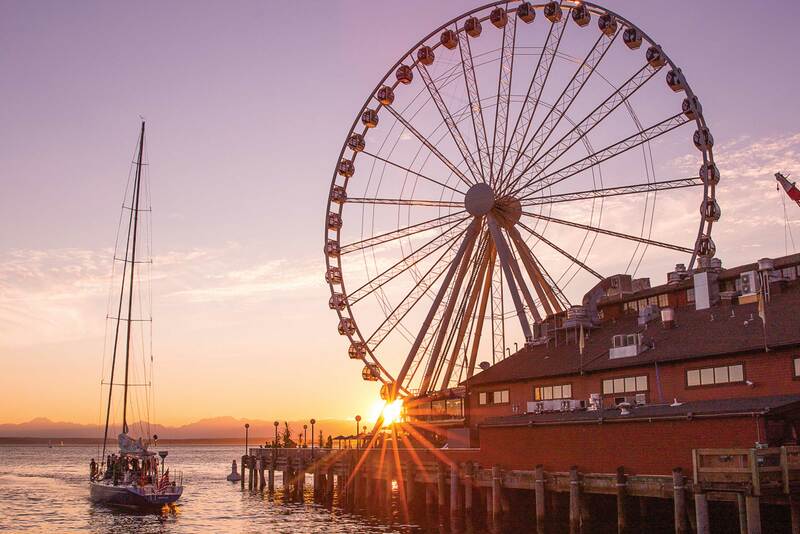 At 175 feet tall, the Seattle Great Wheel rises well above sea level for breathtaking city views. Take to the seas with Argosy Cruises—boats leave from Piers 54 or 55—for day trips around Elliott Bay and adventures to Blake Island State Park on a Tillicum Excursion, which immerses guests in Northwest Native American culture from a longhouse visit to a traditional fish feast.